Selco is an ISO 9001:2008 certified manufacturer offering custom assemblies with fast turn-around. From a simple custom bracket, temperature probe or complex wire harness, our engineers can design your assembly or build directly from your drawing. Offering high-end electronic features to provide extremely precise sensing and control of heating, cooling and humidity. Typical applications include cooling and heating controls for cooking equipment, refrigerators, freezers, dehumidifiers and HVAC equipment. Products are available in Standard Enclosed Controllers, Open Board Controllers and Custom Controllers. Our CP and CS series can be customized to meet your exact application requirements for probe housing materials, lead wire gauges, insulation types, and connectors. Selco’s discrete thermistor family includes precision interchangeable, DO-35, thin film, point matched, epoxy coated, and SMT products. The thermostat line is comprised of automatic reset, manual reset, adjustable or one shot devices for temperature-indicating and regulating equipment and limit applications. The selection includes electromechanical ½” and ¾” disc bimetal snap action, moisture resistant, bulb and capillary, hermetically sealed, probe, thermal cut-offs and thermal protectors. A wide range of choices including hard and soft touch finishes, seven standard colors and a rainbow of other options such as translucent models and custom designs. Selco's quality feel is unmistakable, enhancing the total overall look of your product. Digital panel meters (DPMs) are commonly used for various displays in a wide range of process control instrumentation where analog-to-digital conversion is required. Digital panel meters (DPMs) provide a high level of measurement accuracy not possible with analog instruments and have an added advantage in that they can be accurately and unambiguously read at a glance. BIG ANNOUNCEMENT - ECAP Series is now UL Recognized! Check out our ECAP series! A great fit for many applications across multiple industries, tighter tolerances and accuracies that mechanical thermostats, and a low cost option. To learn more about all of these products, click here on ECAP to learn more or call us now to discuss your design needs. Read Selco's press release here! Selco Products Company is committed to providing knowledgeable technical assistance, timely response to special requirements and prompt product delivery. With Selco, you’ll soon discover that “Our Service Makes the Difference” motto is evident in every phase of your contact with us. Selco is a top-of-the-line temperature controller manufacturer and we offer a wide range of temperature control products to serve a variety of industries including appliance, HVAC, medical, telecommunications, food service, and instrumentation. 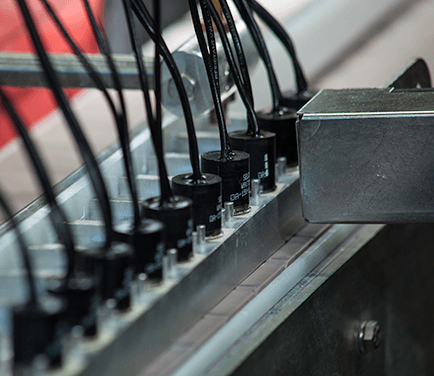 In addition to standard products, Selco also offers customized assemblies, such as custom thermistor probe assemblies, which provide turnkey solutions that can significantly improve your bottom line. We also serve many industries that utilize LEDs for illumination in applications such as cargo trucks, security and emergency lighting, indication, marine, and more. Contact Selco Products for more information about electric thermostats, NTC thermistors, temperature probes, electronic temperature control, high-bright LED lighting, control knobs, and panel instruments.